To keep up with our active lifestyles, we very often want to have music in it as music gives us that extra boost and keeps us going. However, listening to music for an extended period of time using headphones will sometimes cause discomfort to our ears and so using a good set of Bluetooth headphones is important for it not only gives you great audio with comfort, but also with much more mobility. Take your workout further and push your limits with this splash proof and waterproof in-ear headset. This nifty headphone lets you workout and run with total mobility while enjoying your favourite beats. The ear hooks prevent the device from falling off and you can have a peace of mind also knowing that this device has a playtime of 7 hours. More than enough of a day’s workout, no? This Bluetooth sports earphone comes with adjustable ear hooks to hold on firmly but without causing discomfort. This wireless earphone lets you enjoy high-quality music while having unrestricted movement, very suitable for a light workout. With the Philips Action Fit, listening to music and then quickly taking/making a call is easy thanks to its in-line microphone where you can also increase or decrease its volume. The Action Fit will definitely make your listening experience a great one. The AfterShokz AS600SG Trekz is the ideal headset for cycling. Its speakers are not placed or pointed at your ear canals, but it sends sound vibrations thru your cheek bones using advanced bone conduction technology. This will allow you to stay alert of your surroundings when exercising such as hearing overtaking vehicles on the road. Wrapped around the back of your head, the sweat resistant AS600SG also lets you enjoy your music for up to 6 hours comfortably. The SonicGear BlueSports 5 is one of the more affordable wireless Bluetooth headsets available in Malaysia. Its in-built lithium polymer battery has a playtime of 2.5 hours and the set comes with 3 sizes of earbuds to best suit you. It is very suitable for casual sports and is super lightweight as well, easy to carry around and easy to find due to its bright color. Not to mention that it has a stronger 4.1 Bluetooth connection for seamless audio. The Level U Pro can be paired with up to 2 smart devices at a go. Meaning to say that you and your gym partner can workout to the same beats. The wireless Bluetooth headphone set has a flexible frame that can be bent to suit shape of your head comfortably, something that is very much appreciated especially when used for long periods of time. This lightweight (45.7g) device has up to 9 hours of playtime and can even read your text messages to you while you workout. The in-ear earbuds are designed to fit securely in your ears for a great uninterrupted audio experience. The X3 is also sweat proof so you can enjoy a worry-free CrossFit session or workout. It also has noise isolation features so that you will have less distraction. There is also the Jaybird app you can download and customize your own sound profile. 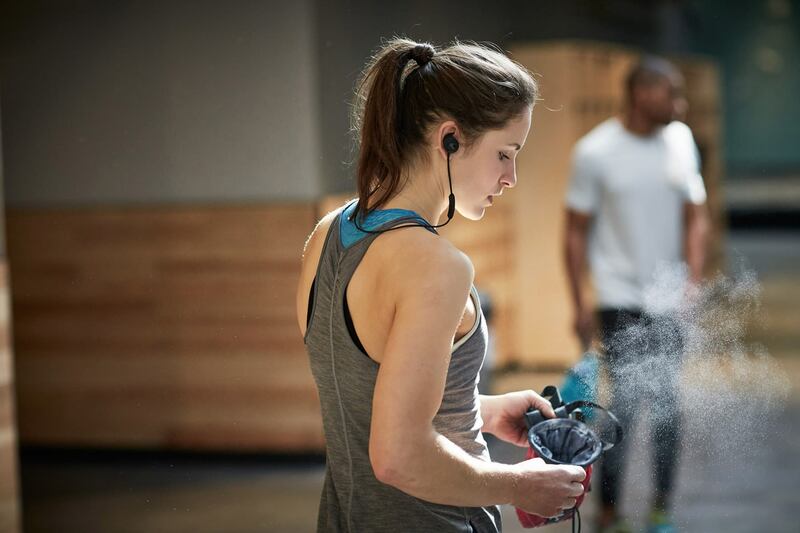 Now you can enjoy the mud, sweat, and tears with the Jaybird X3. This powerful Bluetooth headset has a playtime of 12 hours, and 5 minutes of charging can give you up to an hour of usage. If you are geared for tough training, then the Powerbeats 3 is something that you want to consider getting because it is sweat and water resistant. Having high-performance speakers to take you to the next level in your exercise or dancing, you can also take calls with this device for it comes with an inbuilt microphone. Taking pride in the comfort and stability of the device, Bose SoundSport supports Bluetooth and NFC pairing. The sweat and weather resistance is another advantage of this product that will allow you to take it just about anywhere. The 2 tiny extended wings are placed there to provide support and stability so you can thoroughly enjoy your rigorous workout without having your headset loosening.